Reader Jack Dostal won our World Cup contest even though he didn’t get the winner (he got the closest, though). 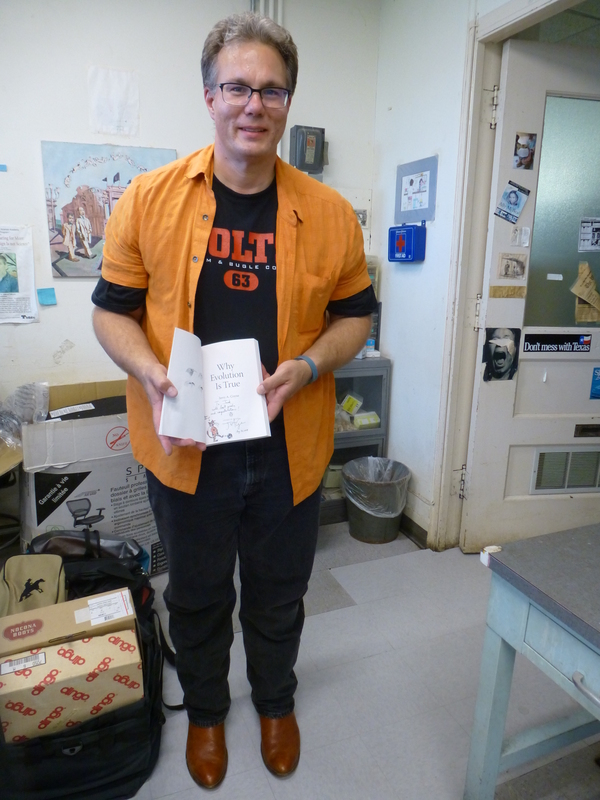 Jack dropped by the lab today on his way from North Carolina to Iowa, and I gave him his prize, an autographed copy of WEIT with a soccer-playing cat drawn in it, wearing Belgium’s team colors. (Jack guessed Belgium beating Croatia in the final, which was the closest anyone got). Here’s Jack and the cat I drew (note that he’s wearing cowboy boots). Fortuitously, Jack also collects cowboy boots, and his collection is much larger than mine (I have about 125 pairs). He brought some by to show me, and this custom pair, by the famous bootmaker Dave Little in San Antonio, caught my eye, for it was in my size. 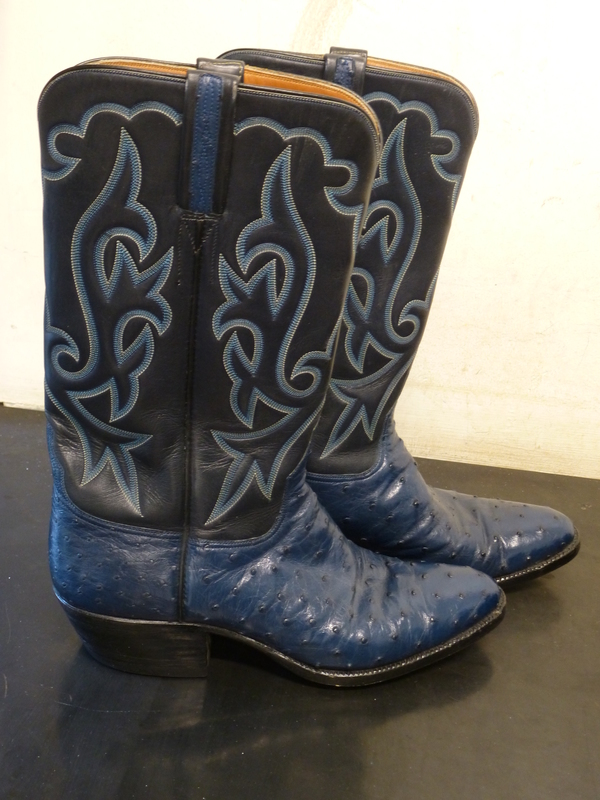 Jack sold it to me for a song, and now I have a pair of Dave Little navy blue ostrich boots. Many thanks to him. This entry was written by whyevolutionistrue and posted on August 13, 2018 at 2:55 pm and filed under books, contest, sports. Bookmark the permalink. Follow any comments here with the RSS feed for this post. Both comments and trackbacks are currently closed. Om’gaaaawdess: THOSE are freakin’ g o r g e o u s ! I want ! I want ! Why is the cat kicking the soccer ball with its claws out? No cat would do that. I can’t imagine Manafort looking cool in a leather jacket – he has the short hair with left** side-parting beloved of male suit wearing types, [who usually have a gut to hide in tailoring] & those who have kept the same hairstyle as their mums imposed in toddler-hood. Over here there was a trend for mousey office guys to wear bush hats & full length duster coats as if an Aussie horseback herdsman. Very amusing while shopping at M&S or having a pint at the local – excellent way to be challenged & beaten up. Manafort & that type – no inner reflection & no ability to see their absurd selves as others see them. ** I noticed on court drawings & photos taken near court that his parting has moved to the right now he has no personal barber – there’s a story there somewhere! Or possibly some images I’ve seen are reversed. Could be a false lead. I quick check suggests we share the same words – THE BEST WORDS compared to Trumpistan! Trevor Noah did a funny shtick of himself wearing an ostrich jacket with the feathers still on. I can’t find Noah wearing ostrich, but I can’t get to see much Noah in the UK due to being Comedy Central paid content. I saw the Colbert & Fallon & Seth Meyers roastings of the ostrich though. Will it make Manafort humble? Nah. See if you can get anything from this link. Yes ta. That clip works here. Sorry, did not think it would embed. P.S I looked up Talley on google images – never heard of him – & he’s somehow able to peacock without looking ridiculous. Kinda like those black doo-wop bands in the 70s who could carry off the outrageous outfits much better than the white Bee Gees et al. Mick Jagger might be an exception. Good point – and Robert Plant. Lots of failures though such as all of the males in glam rock barring Bowie, Bolan, Idol & Elton. Must be something to do with the water here or pervy schooling? Though I’d heard of him for years, I didn’t know much about him until recently. A documentary about Talley was recently released https://www.nytimes.com/2018/05/23/movies/the-gospel-according-to-andre-review-documentary.html. After watching him so gleefully destroy Manafort, it’s a must-see for me. One thing I liked about his commentary was that he was able to, shall I say, really rag on his high fashion crimes and misdemeanors, he effortlessly used that to comment on the corruption and sleaze that Manafort has been involved in and the broader political corruption and sleaze of the moment. And now we have Amorosa! Lordy, Lord. His last comment kills! : “This IS the Bonfire of the Vanities”. Oooo, you are hot, Ms Merilee: GOOD ‘ne ! … … in re your P’l M’rt – snark ! I ‘ld be a – duckin’, too ! Congratulations, Jack! I’m very jealous. Jerry, could you do a tournament for the US Open (tennis)? Plleeeeeaaase? I really want a drawing of Roger Federer as a cat in a signed copy of your book. You two guys will soon put Imelda Marcos’s shoe collection to shame. Where do you store your 126 (!) pairs of boots? I’d love to have a pair of such boots but the shape of my feet and the shape of the boot are definitely not congruent! My feet are so wide they are almost square..
How about horse shoes? Mea culpa. I shouldn’t have written that, no offense to you or your feet, but I just couldn’t resist. Love the soccer cat, Jerry! Congrats, Jack! Well said. It is a lovely, colourful kitty. I had no idea until now that Professor Ceiling Cat was an artist as well as a scientist. 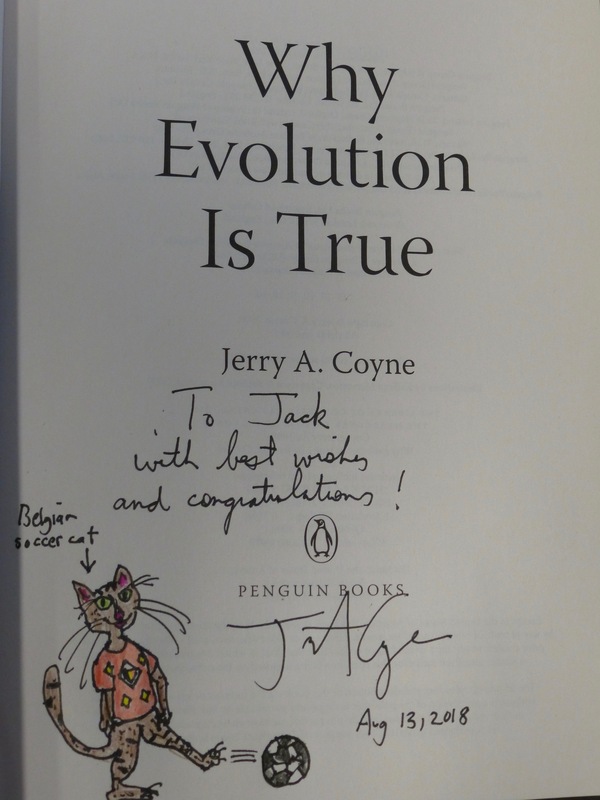 How many cat drawings do you have out there by now Jerry? It would be cool to see a compilation. I have a kitteh drinking coffee sketch…like Theo. All of us lucky enough to have one of your sketches should scan and submit…a JAC Reader’s Felid Sketch Compilation. Just a thought. 😉 You’re probably too self-conscious for such an endeavor. It would be fun though! Belgian was a surprise, they were up for it, but so was France, played well the whole tournament and good on Croatia. Big, but disappointing finish for them. Hadn’t keep up with the form teams pre cup so it made good viewing. Pretty close calling Jack.. winner! boots and all! On the boot side of things, ostrich is reputed to be the most durable soft leather that there is. When conditioned, it will last years/decades without cracking. Resists scuffs, tends to fit lIke a glove. It’s one of my favorites. Well chosen Jerry – I’m glad these Dave Little boots will be able to get some use!